The City of Atchison has released the 2018 Consumer Confidence Report (CCR), a comprehensive accounting of water quality standards and test results for the 2018 calendar year. 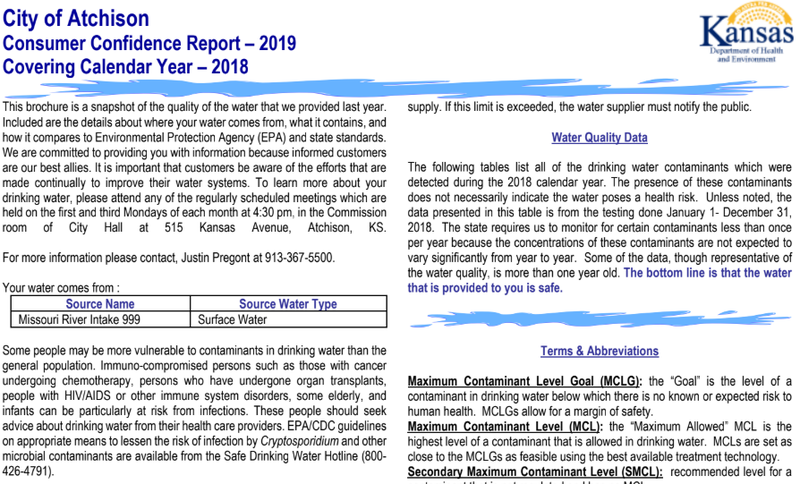 The CRR is an annual report to inform water customers about the quality of drinking water they were provided during the previous calendar year. Water quality tests were performed per the standards set forth by the Environmental Protection Agency (EPA) and the Kansas Department of Health and Environment (KDHE). Test results are itemized in the report and compared to federal and state regulatory standards. KDHE, which oversees water quality, mandates the report. The report details no violations of water quality standards, but does list one instance when lead and copper test notifications were not shared with KDHE by the required deadline. It is critical to note that both lead and copper levels remained well within regulatory limits and that the notification violation was remedied as soon as City staff were made aware of the issue.